ATC Associates, an engineering and environmental consulting firm specializing in geotechnical engineering, construction materials testing, special inspections, industrial hygiene, and environmental engineering services, is celebrating its 30th anniversary this year. Over the last three decades, ATC has worked behind the scenes for hundreds of Fortune 500 companies and was on the scene within hours of several national disasters. From working with the WTC recovery and redevelopment efforts to environmental testing in the aftermath of Hurricanes Katrina and Rita as well as providing geotechnical services and construction materials testing on hundreds of major capital improvement projects across the country, ATC has served as a resource for organizations in petroleum, real estate, retail, manufacturing, financial services, insurance, construction, telecommunications, education, government, and hospitality. ATC was founded in 1982 in Sioux Falls, SD as an analytical laboratory. The company’s initial services included water quality, lake restoration, and general analytical testing. As demand for ATC’s services grew, it added drug screening for the dog and horse racing industries as well as agricultural consulting and informational research. Adapting to an evolving market, ATC began conducting asbestos analyses and air monitoring services in the same decade, birthing a new direction for the growing company. Driven by contractor and clients requests, ATC continued to expand its reach and opened several offices nationwide including New York City, Denver, Lincoln and Omaha, NE, Detroit, St. Louis, Kansas City and Los Angeles. During the 1990s, to increase geographic influence and continue to satisfy its diversified client base, ATC acquired more than 10 companies and 50 additional offices nationwide. Today with more than 71 offices in 39 states, ATC generates more than $200 million in services annually and employs over 1,600 professional, technical, and support personnel nationwide. Learn more at www.atcassociates.com. The National Park Service (NPS) has selected Atkins to provide construction management services for structural repairs to the famous federal penitentiary building on Alcatraz Island in San Francisco Bay. Located approximately one mile north of San Francisco, Alcatraz Island is part of the Golden Gate National Recreation Area and contains numerous structures. The most notorious—Building #68, the cellhouse—served as a U.S. penitentiary for a concentration of “difficult-to-manage prisoners” from 1934 to 1963. Popularly known as “The Rock,” Alcatraz has been featured and creatively imagined in many movies, TV shows, books, and games. The cellhouse improvements are part of the ongoing Alcatraz Historic Structures Stabilization project and will involve repairs to failing beams in the citadel and shower room areas that support the cellblock structures. This will include replacing beams that support the cellhouse floor to stop and repair structural damage, repairing the cellhouse structural floor and associated non-structural patching, and repairing/restoring salvageable beams to protect them from further deterioration. Atkins’ services will include on-site inspections, construction contract administration, office services, and site visits. KS Associates, a multi-disciplined civil engineering and surveying firm, has announced that it now offers 3D laser scanning services. This next-generation technology provides architects, engineers, real estate professionals, facility managers, and design professionals an unprecedented level of precision and detail at a fraction of the time. KS Associates has procured a Leica ScanStation C10, which collects thousands of points per second at the push of a button. The ScanStation C10 can scan an entire room in less than two minutes and can generate richly detailed computer models of the scanned environment. The ScanStation C10 generates “point clouds,” or three-dimensional, photo-realistic datasets representing the external surface of objects. The result is a reliable, robust, and detailed basis for design of the built environment. 3D laser scanning offers additional benefits, such as the ability to non-intrusively capture data for areas that were otherwise inaccessible, such as high-level bridges and overpasses; intricate, hard-to-reach piping systems; or historically preserved off-limit areas, which can now be scanned remotely. Applications ideal for laser scanning include building design and construction, interior design, civil/site modeling, transportation engineering, historical renovation, process engineering, and as-builts. Based in Elyria, OH, KS Associates is a civil engineering and land surveying firm founded in 1987. The firm provides land survey and mapping services; design, bidding and construction administration of public infrastructure and transportation projects; and site development engineering services for residential, commercial and institutional projects. For more information visit: www.ksassociates.com. Michelle Halle Stern, AIA, P.E. and LEED Fellow recently joined HDR Architecture as director of sustainable design services out of the firm’s Chicago office. Formerly an associate at Perkins + Will, Halle Stern is well known for her work in sustainable design for private and public sector organizations, including healthcare, government, and academic projects. She is a registered architect and engineer with over 20 years of diversified experience in the industry. A frequent guest speaker, author, and educator on green design, LEED, and the integrative design process, Halle Stern will serve as a leader and mentor for HDR designers. A strategic thinker with a record of building consensus and developing strong team relationships, Halle Stern will implement new sustainable design strategies and provide assistance on projects and other key initiatives. Halle Stern is committed to Chicago and sustainable design, having started Chicago’s local U.S. Green Building Council Chapter. She is a Core Member of the USGBC Environmental Quality Technical Advisory Group as well as a member of the USGBC Project Based Learning Working Group. She also serves on the USGBC LEED Faculty and is an adjunct faculty member at Robert Morris University. Halle Stern holds a Master of Science in Public Health from the University of Illinois at Chicago as well as a Bachelors of Science in Architectural Studies and Civil Engineering from the University of Illinois, Champaign-Urbana. GZA GeoEnvironmental, a geotechnical and environmental consulting firm, has received the 2012 Engineering Excellence Special Recognition Award from the American Council of Engineering Companies (ACEC) of Maine for their embankment preload program as part of the Veteran’s Memorial Bridge Replacement Project in Portland and South Portland, Maine. The South Portland Approach for the Veteran’s Memorial Bridge Replacement faced difficult constraints, including waterfront construction over the mudflats, permit-based limits on the allowable disturbance area, and a subsurface profile including up to 90 feet of moderate-strength, compressible marine clay. The preliminary and final design and construction of a preload program for the South Portland Approach was executed by the design-build team to provide a cost-effective, safe solution that met the project performance and safety criteria. GZA was the engineer-of-record for the South Portland Preload portion of the project, responsible for design and construction documents and a member of the Reed & Reed / T.Y. Lin International design-build team. GZA envisioned a 25-foot high earthfill preload embankment supported by temporary, anchored, sheet pile cofferdam to limit the environmental impact on the mudflats and developed this concept for preliminary design. During final design, GZA developed a subsurface model for geotechnical engineering evaluations and evaluated short-term and long-term global stability, long-term settlement adjacent to proposed piles, and general approach embankment areas and designed and installed wick drains to promote consolidation. The design met the constraints imposed by the Design-Build RFP, allowed for efficient foundation design, and was constructible for the contractor. The South Portland embankment concept saved over $1 million compared to alternative design approaches. The design incorporated Maine DOT, highway and bridge designer, and constructor collaboration through detailed design reviews at the 50 and 80 percent submittal stages. Geotechnical instrumentation was designed, installed, and monitored to assess the performance of the preload, including settlement plates, piezometers, and inclinometers. The instrumentation confirmed that the preload goals had been achieved, and GZA recommended removal of the preload in winter of 2011, approximately five months ahead of schedule. Founded in 1964, GZA GeoEnvironmental is a multi-disciplined firm providing environmental consulting, geotechnical and geo-civil engineering, environmental remediation, regulatory compliance, litigation support, air quality, solid waste services, specialty construction, occupational health and safety, and site development services. GZA maintains corporate offices in Norwood and has 550 employees and operates 24 offices in the Northeast, Mid-Atlantic, and Great Lakes regions. For additional information, visit www.gza.com. Extreme weather can result in a violent act of nature, and in the past year, much attention has been paid to the disastrous impacts of flooding during the spring and summer. For example, residents of cities and agricultural farmland found themselves at odds when the Army Corps of Engineers wrestled with opening floodgates to channel water away from the metropolitan areas of New Orleans and Baton Rouge in May 2011 and directing the floodwaters to small Louisiana towns and farms. Water became the enemy, but it might have been an unnecessary role. "The relationship between flood conditions and the spatial distribution of urban development has been poorly studied, often because of limitations on available data about stream flow or the common use of generic watershed models in urban hydrologic modeling," says Glenn Moglen, professor of civil and environmental engineering at Virginia Tech. Moglen holds a Ph.D. in civil engineering from the Massachusetts Institute of Technology and works in the university's National Capital Region. Moglen has spent years studying the issue of limiting impervious surfaces such as pavements that act as impenetrable materials to water. He has called for planners "to allow a safety margin when regulating land based on imperviousness, to steer development to already urbanized locations and away from relatively undisturbed locations, and to take advantage of situations that mitigate the deleterious effects of imperviousness on stream ecology." His expertise garnered him an appointment as a special guest editor of an issue of the American Society of Civil Engineers' Journal of Hydrologic Engineering. And he has current funding from the Federal Emergency Management Agency to calculate flood magnitudes as part of the agency's efforts to modernize its maps. In addition, Moglen and his former Ph.D. student Alfonso Mejia of Washington, D.C., who has now graduated from the University of Maryland, have developed a number of distinct models of urbanization that show patterns of impact from both sprawl and clustered development that reduce impacts to water resources. Their work was published in the April 2009 Journal of Hydrologic Engineering. Moglen says their approach differed from previous studies because they looked at distributed effects within a watershed and not the aggregate results at the watershed outlet. They also focused on impacts generated by the spatial forms of urban patterns. In the article, they cast doubt on land management policies promoting a fixed threshold of impervious surfaces. They show that this can result in the unintended consequence of favoring sprawl-type development. "Those within the planning community who espouse threshold-based controls on land development" should be concerned, they wrote. In another study for the U.S. Geological Survey (USGS), Moglen and Dorianne Shivers of Takoma Park, MD, who also worked with Moglen when she was a student, used data from 78 urbanized stream gages across the United States for a study on urban flood frequency. They compared their models to previous results, and a key finding was a new method for estimating floods at ungaged sites using common, easily obtained data. This method eliminated the need to perform costly site visits to make urban flood estimates. Their USGS study also indicated which mathematical models on peak discharges of water performed best: an imperviousness distribution model and a population density distribution model. "These models depend on three predictors each: rural discharge, imperviousness or population density, and imperviousness or population density uniformity. The imperviousness or population density predictor serves to scale up the rural discharge, and the imperviousness or population density uniformity predictor scales down the discharge. This uniformity predictor quantifies the homogeneity of the development in a watershed," they concluded. Michaels Energy announces that Mike Frischmann, an energy engineer at Michaels, was selected as a presenter for the 2012 International Energy Program Evaluation Conference (IEPEC) in Rome, Italy. Mike submitted a paper to the IEPEC conference planning committee on the subject of "On-site Measurement and Verification Versus Project File Review." This paper will demonstrate the quantitative and qualitative differences between file reviews and on-site evaluations. Over 210 abstracts were submitted, and his paper was among those accepted for publication and presentation at IEPEC in Rome on June 12-14, 2012. A CD will also be produced with presentation papers and made available to all attendees of IEPEC. IEPEC is an annual professional conference for energy program implementers; evaluators of those programs; local, state, national and international representatives; and academic researchers actively working in the field of evaluation. The purpose of the conference is to provide a forum for the presentation, critique, and discussion of objective evaluations of energy programs. For more information, visit www.iepec.org. Michaels Energy, a division of Michaels Engineering, specializes in energy efficiency consulting and provides technical, program management, and administrative support for utility demand-side management (DSM) programs. Michaels also provides services to end-users including investment grade feasibility studies, retrocommissioning studies, and LEED consulting. Michaels provides a wide range of energy and engineering support services to utilities, government agencies, and non-profit corporations that administer energy efficiency programs for end users. Jim Cox, Gary Day, Mark Gillen, David Maloney, and Mike Tobash. Located in downtown Reading, Pennsylvania, Entech is a full-service provider of engineering and architectural services, from planning through design and construction. Satellite offices are located in Pottsville, Schuylkill County; Mountaintop, Luzerne County; and Lititz, Lancaster County. For more information, visit www.entecheng.com. Laird Technologies, Inc., a designer and supplyer of customized performance-critical components and systems for advanced electronics and wireless products, has been awarded a U.S. patent for the work of three of its wireless and M2M inventors: RF Engineer III Joseph Combi, Director of Engineering Ayman Duzdar, and RF Engineer III Gary Reed. U.S. Patent #8045592 was issued for work with multiple antenna multiplexers, demultiplexers, and antenna assemblies. The multiplexers and assemblies receive signals from the multiple antennas in a system and combines those signals for transmission into a single output. The demultiplexers receive the single input and output the signal onto separate receivers. The antennas used in this patent included GPS (1574 to 1576 MHz) and world cell frequencies (824 to 960 MHz and 1710 to 2170 MHz). “The benefit of this technology is that it reduces the number of cables required in a long cable harness, mostly in the OEM automotive market, as they have control over the receiver,” says Ayman Duzdar. “It can also be used in tandem with a demultiplexer of the same nature to separate the combined signals into multiple receivers. It reduces cost spent on the harnesses by reducing the number of cables necessary.” The antenna multiplexers are ideal for any market where multiple antenna signals are being delivered from one antenna module to multiple receiver modules and where GPS and cell functionality is required. Laird Technologies is a designer and manufacturer of telematics products with a product portfolio consisting of antennas and integrated reception systems designed to meet the multiple communications requirements of modern vehicles. This includes performance-critical products for wireless and other advanced electronics applications as well as electromagnetic interference (EMI) shielding, thermal management products, specialty metal products, signal integrity components, and antenna solutions, as well as radio frequency (RF) modules and wireless remote controls and systems. Custom products are supplied to all sectors of the electronics industry including the handset, telecommunications, data transfer and information technology, automotive, aerospace, defense, consumer, medical, mining, railroad and industrial markets. A unit of Laird PLC, Laird Technologies employs over 12,000 employees in more than 49 facilities located in 16 countries. GEM Inc., of Walbridge, OH and Capstone Turbine Corporation of Los Angeles, CA have received the 2011 NOVA Award from the Construction Innovation Forum (CIF) for microturbine technology at Syracuse University's Green Data Center, one of the most energy-efficient data centers in the world. GEM’s subsidiary, BHP Energy, and Capstone received the award for the hybrid uninterruptible power source (UPS) microturbine system first used at the Syracuse data center. As a new technology that improves reliability and reduces energy cost, the Capstone Hybrid UPS system anchors a larger integrated power system designed by GEM. The Capstone Hybrid UPS will be installed next at the University of Toledo. GEM is designing and building a power system for the university’s Green Data Center, which shares fundamental attributes of the Syracuse system. The University of Toledo project, to be complete in late 2012, will showcase modular construction and integration techniques that may result in plug-and-playapplication at mission critical facilities across the globe. More than 600 nominations from 20 countries were considered for the 2011 NOVA award. "Each year, the NOVA Awards honor top innovations in construction from around the world that increase quality and efficiency and reduce cost," says Rasha Stino, CIF Vice Chair. "An expert jury carefully selects award-winning innovations with the assistance of leading engineers serving as investigators. Capstone's Hybrid UPS MicroTurbine technology uniquely addresses the needs of power-critical applications." "The Hybrid UPS MicroTurbine is an innovation, changing the world of mission critical energy delivery," said David Blair, President of BHP Energy, a GEM Inc. subsidiary. The Hybrid UPS Microturbine is the first onsite power system in the world to integrate low-emission microturbines with a dual-conversion UPS to provide power for mission-critical loads. The system delivers uninterrupted electrical power, while overall system efficiencies reach 85-90 percent, reducing energy costs, fuel consumption, and maintenance costs. James W. Sewall Company has formed a new multidisciplinary Environmental Sciences group to deliver solutions in water resources and water quality management to government, industry, and commercial clients. Under the direction of Dr. Jeffrey S. (Steve) Kahl, the Environmental Sciences group integrates Sewall expertise in engineering, GIS mapping, and natural resources to conduct research, seek grant funding, and implement large-scale projects in stormwater and watershed management, water quality monitoring, and environmental assessment, planning and permitting. In collaboration with partners in academia, business, government, and the nonprofit sector, the group will help clients adopt best practices and protocols that meet regulatory compliance, reduce liability and costs, and incorporate the newest and best environmental concepts. Dr. Kahl brings to the group 30 years’ experience in environmental research and monitoring, watershed analysis, and natural resource and energy policy and program development. Prior to joining Sewall in April 2011, he was founding director of the Environmental Chemistry Laboratory and Senator George Mitchell Center at the University of Maine and of the Center for the Environment at Plymouth State University in New Hampshire. He was instrumental in founding the Maine Water Conference as well as PEARL, the on-line GIS Maine lakes database, and has been awarded more than $25 million dollars in grants and contracts for universities and nonprofits to address such critical issues as acid rain, mercury, road salt, Atlantic salmon recovery, and water quality best management practices. He is also a member of the graduate faculty at University of Maine and a former staff member of the Maine Department of Environmental Protection. Core members of the Environmental Sciences group include Senior Environmental Scientist Chester Bigelow, III, PWS and Staff Engineer Eeva Hedefine. A professional wetlands scientist for 25 years, Bigelow specializes in water quality monitoring, wetland restoration, and ecological conservation and management. Hedefine has expertise in utilities GIS and experience in environmental permitting, environmental site assessments, and analyses for windpower projects. The group will also engage the in-house expertise of Sewall Senior Project Manager Michael Riley, PE. A new hire, Riley brings 20 years’ experience in water/wastewater engineering for both private firms and municipal utilities. As project manager, consultant, and chief engineer, he has supervised multi-disciplined water utility projects and designed over $100 million in public infrastructure in Maine. Most recently, he managed the Brewer Water Department, a municipal utility serving 10,000 customers. Through the Environmental Sciences group, Sewall is also offering clients grant writing services to secure funding that meets their project needs. Dr. Diane Vatne, an experienced grant writer, will assist Sewall clients and the Environmental Sciences group in securing grants to fund a range of environmental projects. Dr. Vatne has written over $2,500,000 in successful grants for nonprofit organizations in Maine prior to joining Sewall. For more information on Sewall’s Environmental Sciences Group and the integrated services they offer, visit the Sewall web site at www.sewall.com/solutions/environmental/. Founded in 1880, Sewall is an integrated team of geospatial, engineering and natural resource consultants who partner with clients to create practical, sustainable solutions. The company’s diverse portfolio is based on 130 years' experience in surveying, forestry consulting, and civil engineering; 60 years' in aerial mapping; and 20 years' in geospatial systems and software. In the last 10 years, Sewall’s offerings have expanded to include traffic, environmental, and structural engineering; renewable energy development; and geospatial web services. Binghamton University recently opened its new Engineering and Science Building in a ceremony attended by elected officials, local leaders, and University representatives. The facility is located next to the Biotechnology Building, which is part of the University’s Innovative Technologies Complex (ITC). The $66 million, two-story glass, metal and stone building will accommodate the expansion of the Thomas J. Watson School of Engineering and Applied Science. Adding about 125,000 square feet to the ITC, the new building features state-of-the-art, flexible student and research laboratory space as well as suites for new business startups and offices that support the University’s ongoing and expanding industry partnerships. The new building is home to the Department of Electrical and Computer Engineering, the Department of Mechanical Engineering, and the Watson dean’s office. A large rotunda feature connects the two ITC buildings, offering access to laboratories and fostering closer interactions between departments and the research centers currently housed in the biotechnology facility. The building is tracking LEED (Leadership in Energy and Environmental Design) Platinum standards, incorporating passive solar energy for heating, geothermal technology for heating and cooling, energy-efficient windows and skylights to allow for maximum use of daylight. It also includes the latest technology for heat recovery and humidity control. And these green features are already earning recognition. The Engineering News Record recently named the facility the top ‘Green Project of the Year in the New York Region’ in its annual competition. Several unique features have been incorporated so that some building systems, such as the mechanical systems driving the building’s heating and cooling equipment, remain accessible to serve as a teaching tool for engineering students. The design has also taken into consideration the core research model, which will give faculty and students in developing research areas such as microelectronics or network security, the ability to share equipment and ideas, and thereby foster collaboration and limit the duplication of resources. Additionally, the building’s mechanical equipment is located in a tower structurally separated from the building so vibrations do not adversely affect specialized laboratories and research. The building’s two-story photovoltaic wall will provide opportunities for undergraduate and graduate research in solar technology. 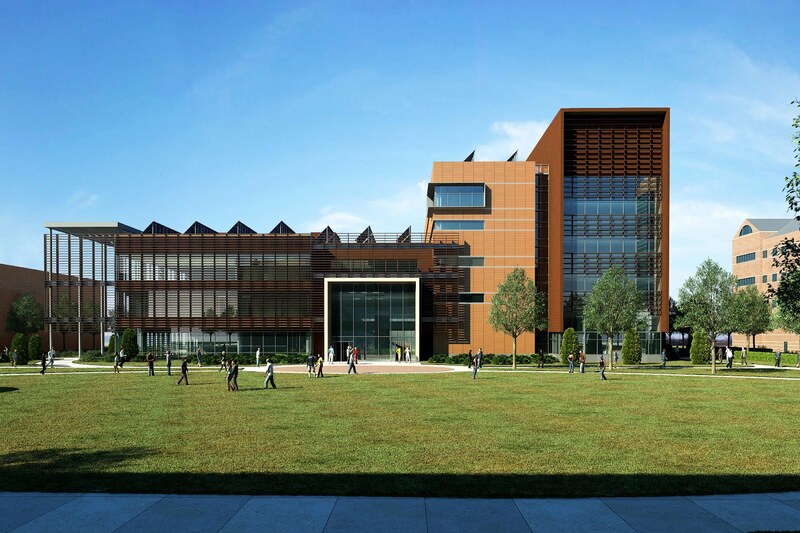 The $95 million Electrical and Computer Engineering (ECE) Building at the University of Illinois at Urbana-Champaign, designed by SmithGroup, has recently begun construction. The new ECE building will create 230,000-square feet of instructional, research, and office space in the heart of the university’s engineering campus. The move will consolidate functions currently dispersed over multiple locations into a single facility, creating a flexible environment to inspire and support interdisciplinary learning and collaboration. When completed in fall 2014, the project will be a major addition to the university’s Urbana-Champaign campus. The university has received $47.5 million in funding from the state of Illinois and has secured $37.5 million in private support. Fundraising is ongoing for the remaining $10 million. The new facility will be constructed on the northern edge of campus adjacent to the circa-1989 Beckman Institute for Advanced Science & Technology and across from the Coordinated Science Laboratory, both SmithGroup-designed facilities. The building program includes classrooms; teaching and research laboratories, including an instructional clean room; an auditorium; faculty and administrative offices; and student gathering areas. It will also house laboratories for research in the fields of thin film and charged particles, optical physics, and electromagnetism, along with varied spaces for the university’s power and energy systems, materials research, remote sensing, and space sciences groups. The ECE building will also establish a sustainability prototype for future University of Illinois projects. Minimizing the facility’s carbon footprint and optimizing energy efficiency were key drivers behind its design. Sustainable considerations include a terra cotta rainscreen cladding system in conjunction with an R-30 thermal envelope for enhanced energy performance. Passive solar design features such as building orientation, 30 percent overall glazing, and exterior shading devices lend to greater daylighting and reduced energy loads. In addition to maintaining a consistent material palette that harmonizes with the neighboring brick buildings, terra cotta baguettes act as exterior shading devices on 80 percent of the glazing. The building is targeted to achieve LEED Platinum certification, the highest level of building efficiency, and is anticipated to receive an EPA Energy Star rating of 99 on a 100-point scale. The ECE Department is also striving to attain a net zero energy design that will enable the building to supply one hundred percent of its energy demands over each year by incorporating renewable energy systems after construction. SmithGroup’s architects and engineers from KJWW have integrated a range of systems that will aid in achieving this goal, including infrastructure for a future array ofphotovoltaic cells, displacement and demand control ventilation, heat recovery chillers with net metering, and a chilled beam system for cooling and heating the classroom tower. The building will incorporate many notable contributions of ECE faculty and staff. It will feature the most sophisticated LED and fluorescent lighting, complex energy conversion systems utilizing advanced power electronics, and intelligent systems and interfaces supported by ever-evolving control and computer technologies. Based in Chicago, SmithGroup is a large architecture and engineering firm composed of client industry-focused practices serving the education, science & technology, workplace, and healthcare markets. A national leader in sustainable design, SmithGroup has 354 LEED professionals and 67 LEED certified projects. In spring 2008, Nick Fenelli found himself at a crossroads in his engineering career. He had gone to work for Airtrax in Trenton, NJ as a consultant several years earlier and had become a right-hand person of company founder and owner Peter Amico in running the business. Airtrax pioneered a unique type of wheel that makes forklift trucks more maneuverable and has spawned a new breed of mobility platforms. “When we were all handed our pink slips that day, we talked about what we could do,” Fenelli continues. A group of four former employees, nearly the entire technical staff, decided to band together and carry on as equity partners, calling themselves Vehicle Technologies, Inc., Vetex for short. They poured in their personal savings and sweat equity. After about a year, they convinced the directors of Airtrax to give them a limited license to build the Sidewinder, the forklift they had developed using their special omni-directional wheel. “We were happy doing the work, and we thought it had a potential besides being able to generate a quick buck for some investors. We thought we could actually change the way people do things and improve efficiencies in a whole lot of fields,” Fenelli relates. Today, he finds himself the president of Vetex and leading it into new territory. The Sidewinder has four unique omni-directional wheels, each consisting of six pairs of polyurethane-covered steel rollers mounted on a hub with tapered roller bearings and angled at 45 degrees to the wheel itself. Each wheel runs on its own AC motor, transmission, brake, and controller. Despite having no steering mechanism, the Sidewinder can travel in any direction and in any manner a standard vehicle goes, and more – think of a skid-steer that can move straight sideways. Fenelli calls it easy to use. “Wherever you point the joystick, that’s the direction you go, and the more you push the stick, the faster it goes.” If you twist the stick, the vehicle rotates on its own axis. For the vehicle to move laterally to the left, the two left wheels spin toward each other and the two right wheels away from each other. As I enter Vetex’ office, Fenelli shows me a prototype demonstration vehicle with the omni-directional wheels, complete with radio control. Here’s my chance to tinker with it. The radio control unit has three joysticks, one for translational movement and two for rotational. He shows me how they can program a vehicle to rotate around any vertical axis you choose. Fenelli then explains to me how the wheel concept works. “It’s all force vector balancing.” With the roller arrangement, the wheel imparts a force 45 degrees to the axis of the vehicle as it turns. If you spin the front and rear wheels in opposite directions, the fore-and-aft components of the forces will cancel out, but the sideways components will add to each other, making the vehicle go sideways. By varying the speed and direction of all four wheels, you can make the vehicle move any way you want. With the omni-directional wheel on the Sidewinder forklift, warehouses can make more efficient use of their space. “It’s ideal for so many applications where there are space limitations or where just moving back and forth in one direction is inefficient to perform a task,” Fenelli explains. Peter Amico started Airtrax to market the omni-directional wheel after buying the rights to the technology from the U.S. Navy, which had acquired the patent from a Swedish engineer, Bengt Erland Ilon, who invented the wheel in 1972. After spending millions of dollars and many years developing it, Airtrax sold the first Sidewinder in 2005. Having come from Ewing, NJ, a suburb just northwest of Trenton, the 57-year-old Fenelli worked with hydraulic presses and process conveying systems earlier in his career. He also designed Yale and Hyster forklifts, working in Lancaster, PA for a while. He started consulting for Airtrax in 1998, designing several prototype vehicles, and came on full-time in 2005 to get U.L. approval for the company’s designs. He also set up a production facility and staffed it. They assemble the omni-directional wheels from parts supplied by several vendors. They build 21” wheels in their Bristol plant because they get used on Sidewinders there, while 17” wheels and prototypes are built in the Ewing facility. A vendor in California makes the rollers for them. Using a proprietary process, they mold the polyurethane oversize onto a metal bearing housing, and then a machine shop in Ewing machines the polyurethane down to the proper wheel profile. As Fenelli tells it, “We have 60-plus fork trucks out there doing pretty well. We’re proud of the performance so far. They’re designed to be maintenance free.” He claims the rollers don’t wear out. “We have a bucket of rollers over in the corner that we’re still waiting to send out.” He tells me the idea sells to users, but it’s a hard sell to accountants because it costs three times as much as a standard truck. This may partially explain why Vetex has put many of its eggs in another basket. They have developed a family of so-called mobility platforms based on the omni-directional wheel. These come into play for installing long or bulky loads, accurately positioning or docking a vehicle or piece of equipment, or simply maneuvering something in tight spaces. Nick Fenelli shows how a roller is fabricated and assembled on to a wheel. “One of the most exciting and visible markets we are in is the theatrical market. The technology has been showcased in two major motion pictures and featured in two TV series, but the latest and greatest is the introduction of our equipment into live theater,” Fenelli reports. In theatre applications, they typically build a set on an omni-directional platform. “You can move it about the theatre before, during, or after the performance, and you can set up a scene and have the scenery active in the production.” He explains how in one application, four of their vehicles move boats in a play called Jonah at the Sight and Sound Theatre in Lancaster, one of the biggest theaters in the world. The boats move by remote control via an iGPS navigation system, with the front of one of them extending out over the audience. Two examples of mobility platforms that use the wheel. This leads to what Fenelli describes as possibly the company’s main mission. For the RoboMate, “Almost everybody we come across wants a customized turnkey system. Our primary role is as a systems integrator merging different types of products. Anything people want to be mobile, we’ll put it together.” They use many technologies such as wire guidance and computer control. Besides omni-directional wheels, Vetex provides engineering assistance, drive system components, and compatible accessories to OEMs. Vetex also brings in technologies like MOSFET (metal oxide semiconductor field-effect transistor), sensors, and closed-loop control and can provide a complete 2WD or 4WD CAN (computer area network, like LAN but for vehicles). This bus-based traction system comes with torque or speed control, regenerative braking, automatic parking brake, and onboard diagnostics. Fenelli rests easier these days knowing that he not only has a stable career but that Vetex is staffed by passionate engineers and technicians who see the full potential of the funky omni-directional wheel and its many possibilities. “It seems like customers are coming to us with new applications every other day,” he says. As their designs play out over time, they should prove that a quick profit isn’t always the answer.